81 execution dates were scheduled in 12 states. 23 executions were carried out in 8 states. 38 executions were stayed by courts. 3 executions were halted by reprieves by governors. 1 execution was halted by commutation. 1 failed execution was halted when execution personnel were unable to set an IV line. 11 OH Anthony Kirkland Stay granted by Ohio Supreme Court on October 16, 2014 "pending disposition of available state remedies .... It is further ordered that this stay shall remain in effect until exhaustion of all state post-conviction proceedings, including any appeals." 11 TX Christopher Wilkins Executed. 12 OH Ronald Phillips Stay granted by magistrate judge in U.S. District Court on December 19, 2016 to permit litigation of challenge to Ohio lethal injection protocol; on December 21, 2016, Gov. John Kasich then rescheduled execution for February 15, 2017. 18 VA Ricky Jovan Gray Executed. 23 OR Gary Haugen Reprieve in place. Former Gov. John Kitzhaber imposed a moratorium on all executions in Oregon, which Gov. Kate Brown kept in place. Gov. Brown has requested a report on the status of the death penalty and indicated the report will inform future policy decisions. 25 TX Kosoul Chanthakoummane Date rescheduled to July 19, 2017. 26 TX Terry Darnell Edwards Executed. 31 MO Mark Christeson Executed. 2 TX John Ramirez Stay granted by U.S. District Court on January 31, 2017 to permit new counsel to file a petition seeking clemency for Ramirez. On February 1, the United States Court of Appeals for the Fifth Circuit denied the Texas Attorney General's motion to vacate the District Court's stay order. 7 TX Tilon Lashon Carter Stay granted by the Texas Court of Criminal Appeals on February 3, 2017 on a 5-4 vote. The Court ruled that Texas had failed to timely serve the death warrant upon the Texas Office of Capital and Forensic Writs. 19 OH Ramond Tibbetts Stay granted by magistrate judge in U.S. District Court on December 19, 2016 to permit litigation of challenge to Ohio lethal injection protocol; on December 21, 2016, Gov. John Kasich then rescheduled execution for April 12, 2017. 2 PA Wayne Smith Legally premature death warrant. Stay granted January 25, 2017 by the U.S. District Court for the Eastern District of Pennsylvania to permit Smith to pursue state and federal post-conviction challenges to his conviction and sentence that are available to all criminal defendants. 3 PA Richard Poplawski Legally premature death warrant. Stay granted February 17, 2017 by the Allegheny County Court of Common Pleas to permit Poplawski to pursue state post-conviction challenges to his conviction and sentence that are available to all criminal defendants. 4 PA Aric Woodard Legally premature death warrant. Stay granted February 9, 2017 by the York County Court of Common Pleas to permit Woodard to pursue state post-conviction challenges to his conviction and sentence that are available to all criminal defendants. 6 PA Patrick Haney Legally premature death warrant. Stay granted February 8, 2017 by the U.S. District Court for the Western District of Pennsylvania to permit Haney to pursue state and federal post-conviction challenges to his conviction and sentence that are available to all criminal defendants. 7 TX Rolando Ruiz Executed. 14 TX James Bigby Executed. 22 OH Jeremiah Jackson Stay granted by Ohio Supreme Court until exhaustion of all state post-conviction proceedings. 12 TX Paul Storey Stay granted by Texas Court of Criminal Appeals to permit Storey to litigate several claims that prosecutors violated his right to due process by presenting false evidence and suppressing mitigating evidence in his case. 17 AR Bruce Ward Stay granted on April 14 by the Arkansas Supreme Court to permit counsel to litigate whether Ward is mentally competent to be executed. Temporary restraining order granted on April 14 by Pulaski County court in litigation brought by pharmaceutical company barring Arkansas from using vecuronium bromide in scheduled execution. Restraining order lifted by Arkansas Supreme Court. 17 AR Don Davis Temporary restraining order granted on April 14 by Pulaski County court in litigation brought by pharmaceutical company barring Arkansas from using vecuronium bromide in scheduled execution. Restraining order lifted by Arkansas Supreme Court. Stay granted by the Arkansas Supreme Court on April 17 pending decision by the United States Supreme Court in McWilliams v. Dunn on questions concerning the right to an independent mental health expert that may affect the resolution of similar issues in Davis's case. 20 AR Stacey Johnson Temporary restraining order granted on April 14 by Pulaski County court in litigation brought by pharmaceutical company barring Arkansas from using vecuronium bromide in scheduled execution. Restraining order lifted by Arkansas Supreme Court. Stay issued April 19 by Arkansas Supreme Court to allow hearing on postconviction DNA testing. 20 AR Ledell Lee Temporary restraining order granted on April 14 by Pulaski County court in litigation brought by pharmaceutical company barring Arkansas from using vecuronium bromide in scheduled execution. Restraining order lifted by Arkansas Supreme Court. Temporary restraining order granted on April 19 by 6th Judicial Court to prevent use of vecuronium bromide in litigation brought by pharmaceutical company. Restraining order lifted by Arkansas Supreme Court. 21 SC Bobby Wayne Stone Legally premature death warrant. 90-day stay of execution granted on April 10, 2017 by the U.S. District Court for the District of South Carolina to permit the court to consider Stone's motion to appoint counsel to represent him in habeas corpus proceedings to which he was entitled to review as a matter of federal law. 24 AR Jack Jones Temporary restraining order granted on April 14 by Pulaski County court in litigation brought by pharmaceutical company barring Arkansas from using vecuronium bromide in scheduled execution. Restraining order lifted by Arkansas Supreme Court. 24 AR Marcel Williams Temporary restraining order granted on April 14 by Pulaski County court in litigation brought by pharmaceutical company barring Arkansas from using vecuronium bromide in scheduled execution. Restraining order lifted by Arkansas Supreme Court. 25 VA Ivan Teleguz Death sentence commuted by Gov. Terry McAuliffe on April 20, 2017 to life in prison, with no chance of parole. 27 AR Kenneth Williams Temporary restraining order granted on April 14 by Pulaski County court in litigation brought by pharmaceutical company barring Arkansas from using vecuronium bromide in scheduled execution. Restraining order lifted by Arkansas Supreme Court. 27 AR Jason McGehee Preliminary inunction granted by U.S. District Court for the Eastern District of Arkansas staying McGehee's execution until Arkansas Parole Board complies with 30-day period for public comment on its 6-1 recommendation for clemency and Gov. Asa Hutchinson decides whether to issue clemency. 16 TX Tilon Carter Stay granted on May 12 by Texas Court of Criminal Appeals to permit the court to consider claim that new evidence shows that Carter's conviction was a product of scientifically erroneous and false forensic testimony that the victim had been smothered. 17 OH Donald Ketterer Stay granted by Ohio Supreme Court until exhaustion of all state post-conviction proceedings. 24 TX Juan Castillo Rescheduled for September 7, 2017. 26 AL Thomas Arthur Executed. Scheduled for May 25, 2017, a temporary stay of execution was granted by Circuit Justice Clarence Thomas so U.S. Supreme Court could consider petitions concerning denial of access to counsel during the execution and to records related to the execution of Ronald Smith. After Court denied certiorari on these claims, Alabama began the execution at 11:45 p.m., just prior to the state-law mandated midnight expiration of its death warrant. Athur was pronounced dead at 12:15 a.m. om May 26. 8 AL Robert Melson Stay granted on June 2, 2017 by the United States Court of Appeals for the 11th Circuit to permit the court to consider a joint appeal by five Alabama death-row prisoners of a district court order denying their challenge to Alabama's execution protocol. Briefing in that appeal will not be complete until June 28, 20 days after the execution date. The court said deciding the issue for Melson while he is under warrant "would, in effect, telegraph the outcome of Melson’s coappellants’ appeals, and that would be untenable." On June 6, 2017 the stay was vacated by the United States Supreme Court. 19 OH Mark Pickens Stay granted by Ohio Supreme Court until exhaustion of all state post-conviction proceedings. 19 TX Kosoul Chanthakoummane Stay granted by Texas Court of Criminal Appeals on June 7, 2017, to review claims of discredited forensic science. 15 PA Omar Shariff Cash Legally premature death warrant. Stay granted June 28, 2017 by U.S. District Court for the Eastern District of Pennsylvania to permit Cash to pursue state and federal post-conviction challenges to his conviction and sentence that are available to all criminal defendants. 22 MO Marcellus Williams Gubernatorial stay (reprieve) granted by Governor Eric Greitens on August 22, 2017. The Governor appointed a Gubernatorial Board of Inquiry to further consider Marcellus Williams’ request for executive clemency. 7 TX Juan Castillo Stay granted by the Bexar County District Court on August 30, 2017 in response to the Bexar County District Attorney's motion to withdraw Juan Castillo's execution date. The request was made after Governor Abbott declared a state of disaster for 30 Texas counties because of Hurricane Harvey. The court also issued an order setting a new execution date for December 14, 2017. 26 GA Keith Tharpe Stay granted by the U.S. Supreme Court on September 26, 2017 "pending the disposition of [Tharpe's] petition for a writ of certiorari" seeking review of a decision by the 11th Circuit denying him an appeal of his habeas corpus claim that his death sentence was unconstitutionally tainted by the participation of a racially biased juror. 5 AL Jeffrey Borden Injunction granted under the All Writs Act by U.S. Court of Appeals for the 11th Circuit on September 29 staying Borden's execution through October 29, 2017 to permit ongoing civil rights challenge to Alabama's execution protocol. Injunction vacated by U.S. Supreme Court, with 3 justices dissenting, on October 4. Stay granted by the U.S. District Court for the Middle District of Alabama on October 5 after finding a "substantial likelihood of success" on the merits of the civil rights challenge. 16 NV Scott Raymond Dozier Rescheduled for week of November 13 by Clark County District Court. 18 TX Anthony Shore 90-day stay of execution granted by Harris County trial court to permit prosecutors to investigate claim that Shore was colluding with another death-row prisoner to confess to the murder in that case. Execution rescheduled for January 18, 2018. 19 AL Torrey McNabb U.S. Court of Appeals for the 11th Circuit on September 29, 2017 denied motion for stay of execution for technical reasons, without prejudice to his first seeking an injunction against his execution in the District Court. The Circuit Court order set forth the factors the District Court must consider and indicated that McNabb would be entitled to a stay. 26 TX Clinton Lee Young Stay granted by the Texas Court of Criminal Appeals on October 18, 2017 and evidentiary hearing ordered on Young's claim that newly discovered evidence (gunshot residue on the gloves of the prosecution's key witness and affidavits of four prisoners that this witness had bragged about committing the killing and framing Young) shows that his conviction and sentence were obtained with false or perjured testimony. 8 TX Ruben Cardenas Ramirez Violation of Vienna Convention right to consular notification. In 2004, the Organization of American States' Inter-American Commission on Human Rights issued "precautionary measures" against executing Cardenas without a judicial determination of the impact of the Vienna Convention violation in his case and in 2008 determined that Cardenas was entitled to a new trial. He has received no review of his treaty claim in the Texas state or federal courts. 9 AR Jack Greene Stay granted by the Arkansas Supreme Court on November 7, 2017 on petition raising issue related to Arkansas procedures for determining competency to be executed. 14 NV Scott Raymond Dozier Stay granted by the Clark County District Court on November 9, 2017 to permit the prosecution to appeal its ruling barring the use of a paralytic drug in Nevada's execution protocol. 15 OH Alva Campbell, Jr. Reprieve issued by Gov. John Kasich on November 15, 2017 after personnel of the Ohio Department of Corrections failed four times to find a suitable vein to insert an intravenous execution line. 16 TX Larry Swearingen Stay granted on October 27, 2017 by trial court because of clerk's error in serving notice of execution. 17 PA Junius Burno Legally premature death warrant. Stay granted by the U.S. District Court for the Eastern District of Pennsylvania on October 2, 2017 to permit Burno to pursue state and federal post-conviction challenges to his conviction and sentence that are available to all criminal defendants. 1 SC Bobby Wayne Stone Legally premature death warrant. The death warrant was issued before Stone had been provided habeas corpus review to which he is entitled as a matter of federal law. Stay granted by the U.S. District Court for the District of South Carolina on November 21, 2017 to permit Stone to pursue federal habeas review of his conviction and death sentence. 14 TX Juan Castillo Stay granted by the Texas Court of Criminal Appeals on November 28, 2017 and case remanded to the Bexar County District Court for resolution of Castillo's claim that his conviction and sentence were obtained with false or perjured testimony from a prison informant. 29 PA Michael Pruitt Legally premature death warrant. Stay granted by the U.S. District Court for the Eastern District of Pennsylvania on December 4, 2017 to permit Pruitt to pursue federal habeas corpus challenges to his conviction and sentence that are available to all criminal defendants. * On February 10, 2017 Governor John R. Kasich issued a statement revising the schedule for eight upcoming executions. This revised schedule was in response to the U.S. Court of Appeals for the Sixth Circuit’s denial of a motion to stay enforcement, pending appeal, of a federal magistrate judge's order declaring Ohio’s execution procedures unconstitutional. ** On May 1, 2017 Governor Kasich issued another statement revising the schedule for nine upcoming executions. This revised schedule was in response to the U.S. Court of Appeals for the Sixth Circuit’s order setting a briefing schedule for the Court's en banc rehearing of the state's appeal of a federal magistrate judge's order issuing a preliminary injunction barring Ohio from carrying out 3-drug executions using midazolam or any execution using a paralytic agent or potassium chloride. ^^ On October 19, 2015 the Ohio Department of Corrections issued a statement that Governor Kasich granted reprieves postponing all executions that the state had scheduled in 2016. Ohio has been unable to obtain the execution drugs required to conduct executions under state law. All execution dates have been rescheduled by the state. Return to Executions. See also Stays of Execution for 2010, 2011, 2012, 2013, 2014, 2015, and 2016. 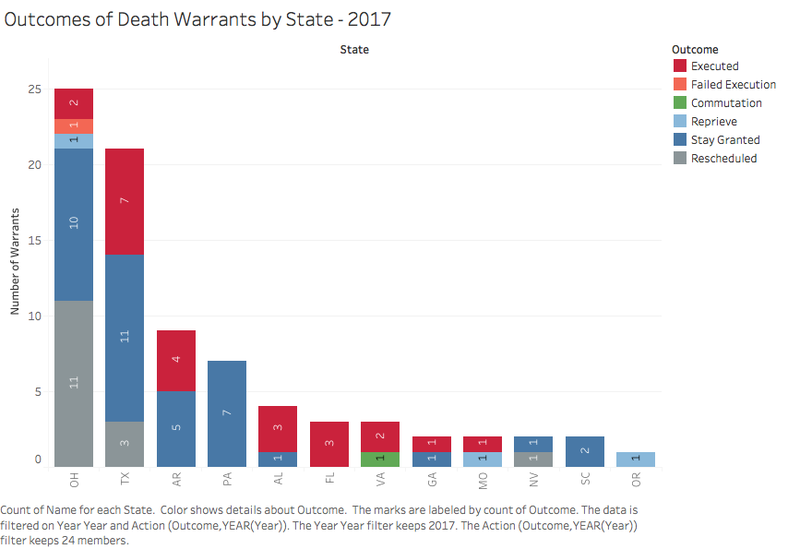 To compare the number of executions carried out in recent years with the number of executions actually scheduled, see Outcomes of Death Warrants in 2014, 2015, 2016, and 2018.